By now we're pretty sure you're familiar with Instagram and its many challenges of algorithms and creating engagement. Trying to define your voice while maintaining a cohesive brand presence is a challenge we all face no matter what social platform we are using. If you're like us, you spend hours staring at the computer screen wondering what to post on social media. There are so many rules and expectations surrounding a perfectly curated feed, not to mention the time commitment required to stay on top of it all. As you already know, Instagram is anything but instant. There are plenty of apps and information out there that can assist you on how and when to post to Instagram but when it comes to creating a unique look for your feed, the options are limited. With your feedback as our motivation to make your lives a little easier, we are so excited to launch our first round of templates for Instagram posts, stories, and Pinterest! We have gotten a ton of requests for social media templates after releasing our Eucalyptus collection. The newest set of designs will save you a ton of time & will allow you to create a consistent, custom branded look. Swap out the colors & fonts to stay true to your branding, and you'll have a drool-worthy Instagram feed in no time! 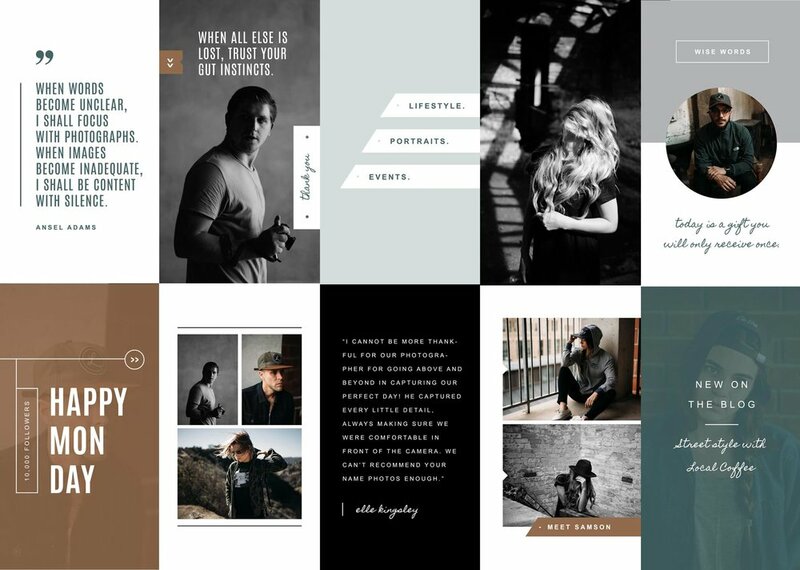 These designs are perfect for photographers, social media managers, graphic designers, and wedding professionals. If you have access to Photoshop, you're good to go! We've taken care of the design & content creation to give you ideas on what you should be sharing to your followers. Don't worry too much about the current colors & fonts, as all of those can easily be swapped out. With customizable Photoshop files, you can use our designs over & over again without having to hire a graphic designer. Use just a few or all of the designs to take your social media game to the next level. Start attracting your dream clients with a beautifully branded social media feed! Easily update all colors, text, and fonts. Plug in your own images and show off your best work. Drag & drop your logo onto the Photoshop files to create a consistent look with your current branding. P.S. Give us a follow on Instagram if you haven't already and stay tuned for giveaways, special offers, and some behind the scene looks at home!